Here is a sequence of discoveries, driven by the opportunity of customer needs, and a growing ability to serve. Eleven ladders installed in my first two years of practice, were naive purchases at Lowe's and Home Depot, except three expensive Rainbow ladders. Then I had the nerve to try a Fakro. In this I have dealt only with Skywin Fakro, in Chatham, Ontario. I don't understand the internet marketers who attempt to parallel the direct Fakro sales. On the other hand, the possibility sales will grow through Home Depot, online, is a driver of my sharing of information. I will support a sale, from anywhere, with my sharing of experiences, discovered methods, and product improvements. Fakro Job One, November, 2007, LWS-P 30/54. An unfortunate choice of ladder forced innovation. Here a 30" ladder was required at an 8' ceiling. The 30" ladder is only offered with 54" rough opening length. Look what happens absent planning, and willingness to do some careful carpentry. It is respectful of the customer, to have the bottom section within reach. The MDF face of the ladder was painted on-site, with two coats of oil-base primer. Flexible grout seals and decorates the space between the ceiling drywall and the ladder frame. By fingertip application, the ceiling texture pattern is extended onto a 45 degree drywall edge. Fakro Job Two, June, 2008, LWS-P 22/47. Innovation of ladder rough frame, set in a 2x4 floor. Baltic Birch 3/4" plywood formed a 9 1/4" rough opening integral with the ladder frame. 2x6 at head and foot retain a drop-in sled. There was some virtue in this, but I have not done it again. Fakro Job Three, October, 2008, LWS-P 25/54. Another middle-section trimming of a 54" ladder, for 96" floor-ceiling distance. I replaced a broken 54" American ladder, and made a mistake. I could have chosen a 47" ladder, and a 7" plaster patch. Avoid going with the momentum of American ladder dimensions. The back end of this ladder does nothing but weaken the attic knee wall. Fakro Job Four, October, 2008, LWS-P 22/47. Here, I was still installing a ladder with the door assembled in the frame. I tried another sled idea to permit one-man installation. Brackets came off quickly, with difficulty of passing truss elements over a garage. Abandoning sled notions, I have hereafter achieved one-man installation by removing the door, to first place only the ladder frame. Fakro Job Five, April, 2009, LWS-P 25/47. This job is well-documented in the Attachment, Groff Attic Ladder.pdf, at bottom of this page. Many lessons were learned, and I ask the reader to consult the pdf. I must choose here among three presentation options, direct post and comments, Picasa Web Albums, and pdf Attachments. I do the pdf's always, and Picasa presentation is a duplication of effort, with results that don't neatly print. Please accept my preference for the pdf's. Photos here address the issue of an "unlucky step." Leveler legs are especially needed here, because of roughness of the trimmed legs where a step was cut out. An opportunity to set ladder angle shallower to keep the step was missed. The "Limit Arm" which sets the angle of the deployed ladder, has three holes at the upper end, visible here. Each reset of the hole engaging the pivot bolt, changes door angle by two degrees. This was not explained, was not appreciated, and the extra holes were eliminated after 2009. The safety pole hand grips were invented in this job. Fakro Job Six, May, 2009, LWS-P 22/47. I got another try at installation of a LWS-P 22/47 among trusses over a garage, not too tall at 106" FC, the maximum listed range. The first photo shows cut drywall, ready to be released with a couple of screws, from below. Here I have learned to fit with only the ladder frame, door detached. Frame squareness was locked with a 12" x 24" piece of plywood screwed at one end. The drywall cut was traced from above against bottom-of-frame inside dimensions. Slide the frame into position. Attach the door and achieve a square fit. Lock in place with shims and screws. Detach the door. Fuss trueness and grout the drywall edge. Reach to the floor was marginal, it turned out. Variables include actual door angle vs. predicted 65°, and floor slope. I needed leveler legs to complete the reach, and of course to fight kick-out. Looking back, in September 2010, I know a fire-rated ladder should have been offered, as garage and house attics are in-common, but still do not have an affordable fire-rated ladder of acceptable design, to offer. Fakro Job Seven, May, 2009, LWS-P 22/47. Replacing a broken 54" American ladder over a well-used garage. Large-area patches of the shorter opening, and of the original, unused opening, were the biggest challenge. Any installation where wet edges must be formed around the ladder is difficult. Fakro Job Eight, May, 2009, LWS-P 25/47. Replacing a broken American 25/54. With a heavily-textured plaster ceiling, it is largely a job of difficult plastering. Here I have evolved in plastering skill, I use wire lath, PlasterWeld, flexible grout and Structolite. Note the plan of setting 1/4" plywood from the ladder packaging, with foil tape, to protect the door face and to serve as a trowel guide. A new gas furnace had been installed via a difficult closet opening. With need of access for insulation, decking and storage, it is time to install a ladder. The only location choice is directly under the joist-bay furnace return air duct. I wanted to install a LWS-P 25/47, but could not eliminate all obstacles, principally the gas supply pipe, and traded for a 22" ladder. The ladder rough frame is 2x10, compatible with a top deck of upright 2x4 framing, over 2x6 joists.. The ladder door will be painted, and a repaired ladder was acceptable, finding a use for a reserve ladder that was broken in FedEx shipment. Fragile attic ladders are barely shippable except on pallet. This installation has uncommonly short floor-ceiling distance, where the hallway ceiling was lowered to give more attic headroom. The modified ladder is much easier to handle, and does not interfere with a nearby door. Top-heavy swing elements, in motion, can be dangerous. Planning takes care and experience, and cooperative compromise. 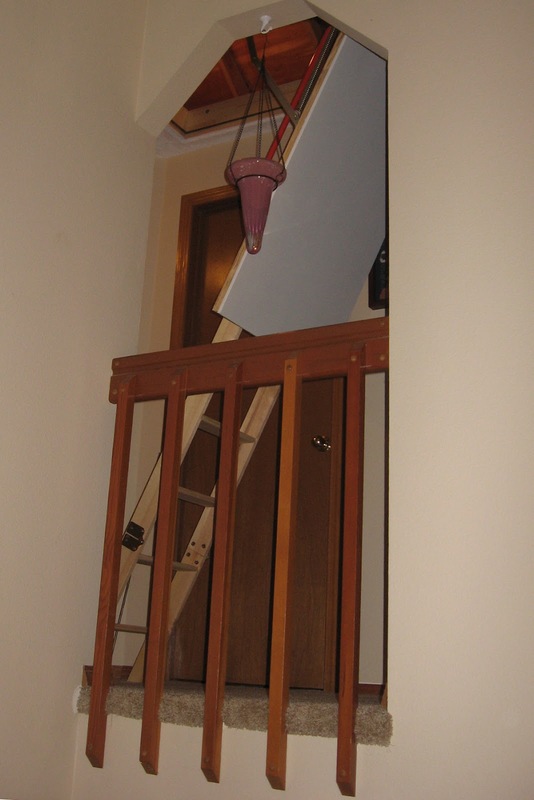 Here egress in the attic is compromised, with need of immediate turn about the safety pole for all attic tasks. It is the better way. Replacing another jammed-open American ladder, and reversing direction for convenient egress in the attic. It is always safer to make turns at the bottom of the ladder. Taking care of head-bangers is sometimes the first task. A decrepit American ladder hung open by weight of decorative drywall. The solution includes a good example of a 2x10 frame that obviously strengthens the attic floor. The ladder is offset as close as possible to a wall, and direction is reversed. The relocation patching is not a big deal, with drywall. Double click a small slideshow, to view full details of this job, directly in Pacasa Web Albums. Putting this ladder in best possible location was merely a huge challenge. This installation was a team effort with a homeowner clever enough to find a compelling bargain of quality and price, for a steel garage ladder, at Home Depot Online. Please compare the installation process evident in the slideshow, with manufacturer instructions. This installation in 2x10 flooring at regular 24" oc, was not challenging, with merely two added 2x10 rough frame ends, slid into contact with the installed ladder frame. Innovation is first the removal of the heavy steps for lifting and mounting the frame. With help, I saved some time by not detaching the door. The pretty red handle is an important safety feature, not discovered in the order process. An r5portals installer or planner will have a bolt needed for the handle, and not provided, and will offer other safety and finish features. Beyond September 2010, door angle is offered as a variable, for shallowest possible angle and best use of the available steps length. The OWM ladder, and corresponding LWM, with insulated door, have virtue in excellent traction of stamped steps, if you are wearing shoes. They are deficient of custom-cutting section lengths (please see next installation description), and I have not yet committed to leveler leg installation with them, in part for control of kick-out. I am not pleased with visible bowing of the stowed door with OWM and OLN ladders. The OSB door material has little stiffness. I think any garage ladder should have the stiffness of a laminated door. Over time and with humidity, a bowed OSB door will develop permanent curl. In the Attachment, I describe a four-section ladder that will improve upon this ladder, for this customer. The steps, and the deployment challenges, are identical for LWS-P, LWF, and OLN-P ladder families. This installation has remained tentative, with negotiation for improvement of design I found defective. The ladder is sold with very strong and obtrusive door-closure springs, intended to allow emergency slamming, apparently. I wanted a fire-rated door, with ordinary hardware, springs out-of-the-way, resident on the door and not in the ladder frame. At October, 2010, I have rebuilt my Fakro LWF, with resort to LWS springs and limit arms, with door angle adjustment, set to 64 degrees, still with out-of-reach three-section deployment. I will fully describe the conversion, after I obtain additional steps to permit four-section deployment. Here are simple drawings. The second is of the condition awaiting additional step sections. An angle adjuster is visible in this photo, a fabricated steel bracket with four angle positions separated about 2 degrees. I will find such brackets unnecessary. Note the beautiful pastel color of the fire-resistant door face, and a band about the door, that is pressed against the ladder frame by thermal expansion. At September 2014 this ladder is like-new and without wished-for replacement sections that would permit a less-steep and more-friendly four-sections deployment. Please see captioned photos of the Job 32 customer installation, in a Picasa Web Album. The beautiful LTK ladders built as a batch in 2008, have not sold well at offered price of about $500. They are now my preferred ladder, while available at a discounted price. The availability of affordable ladders is uncertain in 2014, as manufacturers yield to regulator pressure, that they be of impractical thickness at R10 or more.